Although Brac is the largest island in Dalmatia, and the third largest island in the Adriatic, it’s still pretty easy to explore the island in a day. Gecko tour does this in a Land Rover accompanies by a local expert guide – perfect for Brac’s rough ground. The Gecko tour includes a visit to Pucisca and the Stonemasonry School, visits the historical village of Skrip and takes in the views from the stunning Vidova Gora Mount amongst many other sits and sounds of Brac. Beaches on the island of Brac are one of the island’s top highlights. Generally, beaches on the south side of the island are preferred. They tend to be gentler, larger, mostly made of fine pebbles, so fine it feels like sand. The most famous beach on the island is the Zlatni Rat (Golden Cape) beach. Located at the west end of Bol, this 1 km long beach stretches into the sea in a shape of a cone. It’s a wonderful beach to swim but beware, it gets really crowded in high season and in the view of the Gecko best avoided in July and August. Beaches below the village of Murvica are also popular. If you want to skip the crowd, you’ll need to go further out of Bol. The best way to do that is by boat. You can hire boats pretty easily on Brac, with just a car license your hire will be restricted to 4HP but that gets you around – albeit slowly. If you have a boat license, take it with you, this will allow you to hire more powerful speedboats. 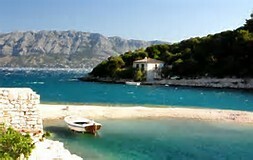 Povlja, located in a bay of the same name, has gorgeous beaches too. Beaches on the north side of the island are fewer, and rougher. The coast is a little rockier. However, the only sandy beach on the island is situated at Lovrecina, on the northern side of the island. Situated near Postira (about 3kms outside) it’s great for families with small kids as the gradient is very gentle and water very warm as the its so shallow Lovrecina is great for those picigin enthusiasts amongst you (see Gecko blog – Picigin). There a great little café there for lunch and cocktails in the summer – worth a visit. Postira also has some lovely coves – the nicest opposite the Bracera pub – just outside the town and wonderful for a sun-downer. The Gecko’s top restaurant on the island would be the restaurant Kopacina in Donji Humac – Kopacina. 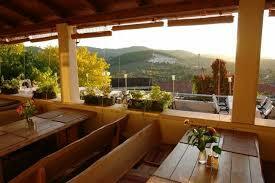 It’s a simple place with a large and very pleasant outdoor terrace with panoramic views. Kopacina serves island’s famed lamb in all ways you can imagine (roasted, as peka (see Gecko blog – Peka), baked in a fireplace under a bell-shaped lid, grilled chops, stew, you name it), but also seafood, veggies, risottos and pastas. Seafood is really good here, although the restaurant is located inland. Oh well … room for one more – Konoba Palute – Supetar, this gets a final place for two reasons. Firstly, it serves the best pepper steak the Gecko has ever sampled. The Gecko has been a patron for years and the pepper steak sauce and dish generally has never changed!! Mrs Gecko tells me the fish is always good but I don’t know as I’ve always had the pepper steak – I take every opportunity! Secondly, it is one of the few restaurants which is open throughout the year on Brac. It’s a most welcoming place in winter or on the fringes of the season when many restaurants on Brac are shutting down. Stina winery in Bol – a state-of-art winery located at Bol’s quayside. If you get a chance, visit the Franciscan Monastery in Bol and taste their homemade dessert wine Prosek. 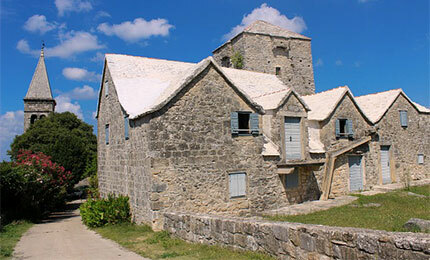 The oldest settlement on the island, Skrip is simply a must-visit place. It’s located inland, not far from Supetar. Skrip is rich in history and a great alternative to the hustle and bustle of coastline towns. Housed in a 16th century Radojkovic Tower, the Museum of Brac reveals the island’s history; Housed in an olive oil mill dating from 1864, the Museum of Olive Oil displays old equipment used to make an olive oil and presents traditional process of olive oil making. The Museum of Olive Oil opened in Skrip in May 2014. Kruno Cukrov restored an old family mill that first opened back in 1864. A small family-run museum displays traditional equipment and tools used to process olives into olive oil. There is also a small shop where the family sells their homemade products like olive oil, vinegar, jams, etc. On the top floor there is a small tasting room. 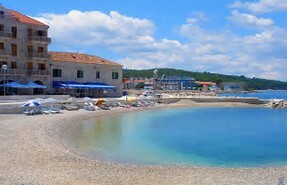 The island of Brac is famed for the white marble found on the island. The only Stonemasonry School in Croatia, and one of a few in all the world, is found in Pucisca on the island of Brac. The Gecko tours includes a fully guided tour of the school – worth a visit. Vidova Gora is the highest summit, not only of the island of Brac, but of all Adriatic islands. The summit is 778 m high. If you aren’t into hiking, or visit Brac during the summer, when temperatures are too high for hiking, don’t worry, Vidova Gora is easily reachable by car and the views are breathtaking. 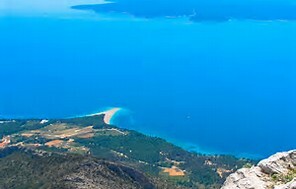 From the summit you’ll enjoy a wonderful view over popular Zlatni Rat beach, the island of Hvar and its rugged coastline, and the blue Adriatic sea beyond. On a clear day you can see as far as Italy. The little populated, south shores of the island of Brac were designated military zones in ex-Yugoslavia. 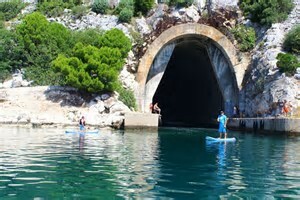 Former submarine pens that can be found in Maslinova, Kruscica and Smrka bays are seen today as a shelter for local fishermen, a tourist attraction and swimming spots. 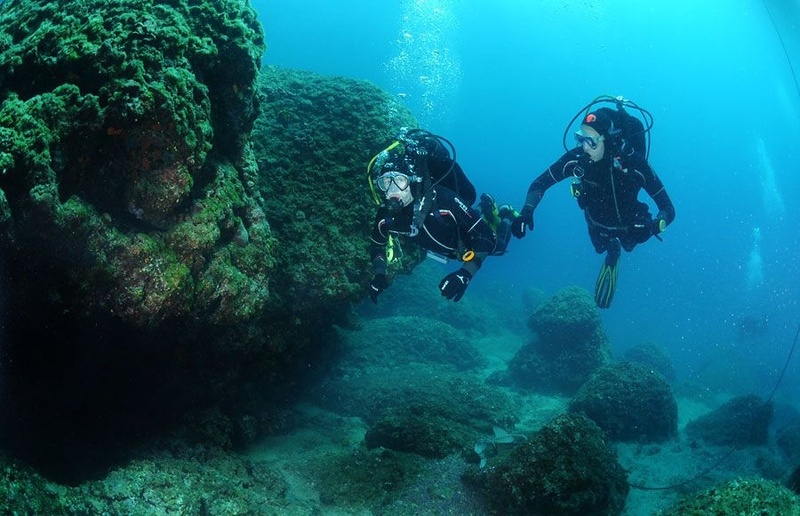 Although neighbouring islands Hvar, Vis and Solta, represent more popular diving destinations, and many diving centers on the island of Brac offers boat trips particularly to Hvar, Brac does have couple of interesting diving spots along its coast. Drasine Cave at only 5 to 8 m depths reveals remains of a Roman mosaic. Golubinja Spilja abounds in underwater flora, fauna, rocks and reefs. Whether you’re an experienced windsurfer or someone who’d just like to try it out, windsurfing in Bol won’t disappoint you. The Zlatni Rat Beach is actually one of the most popular spots in Croatia for windsurfers. There are a few windsurfing centers in the vicinity of Zlatni Rat beach offering windsurfing courses and equipment rental. Big Blue Sport, Big Blue Sport – Bol located at the beach below the hotel Borak, is a favorite windsurfing center in Bol. Staff is super friendly, prices are affordable, and they often run specials with good discounts. For a beginner group course expect to pay 25€ per hour , while an advanced individual course will set you back 45€ per hour. School board sail rental costs 18€ per hour, or 40€ for 4 hours.